"In a recent study, Jordan LaBouff (University of Maine) worked with colleagues at Baylor College to discover whether attitudes to different groups are affected by subliminal Christian priming. So what effect does religious priming have on ordinary people? To test this, LaBouff stopped people at random outside a church in the Netherlands (and, to check if the effect was culturally specific, a few people outside Westminster Abbey in London). He asked them a series of questions, including asking them to rate their attitudes to different groups on a 1-10 scale. He also stopped some other people in a location that contained only civic buildings (in England, the location chosen was the Houses of Parliament). 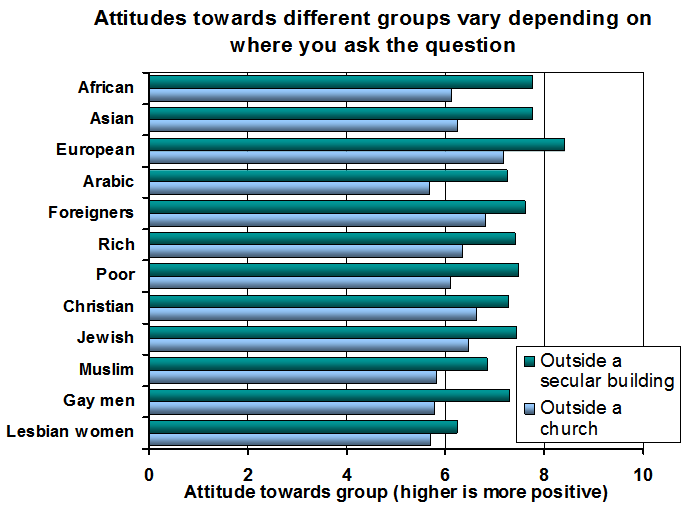 But, as you can see from the graph, attitudes towards every single group were more hostile when people were asked outside a church. All the differences are statistically significant (except the difference in attitudes towards Christians)." 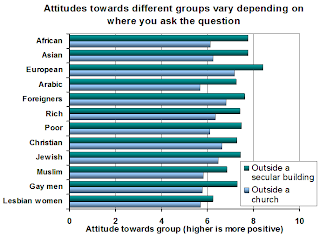 Attitudes towards different groups vary depending on where you ask the question.